“Nonprofit organizations associated with the Tea Party movement have longstanding ties to tobacco companies, and continue to advocate on behalf of the tobacco industry’s anti-tax, anti-regulation agenda,” said senior author Stanton A. Glantz, PhD, director of the UCSF Center for Tobacco Control Research and Education (CTCRE) and a UCSF professor of medicine and American Legacy Foundation Distinguished Professor in Tobacco Control. The study will appear on Feb. 8, 2013 in the journal Tobacco Control, and shows that rhetoric and imagery evoking the 1773 Boston Tea Party were used by tobacco industry representatives as early as the 1980s as part of an industry-created “smokers’ rights’’ public relations campaign opposing increased cigarette taxes and other anti-smoking initiatives. 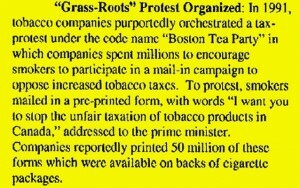 From previously secret tobacco industry documents available at the UCSF Legacy Tobacco Documents Library, IRS filings and other publicly available documents, the study authors traced a decades-long chain of personal, corporate and financial relationships between tobacco companies, tobacco industry lobbying and public relations firms and nonprofit organizations associated with the Tea Party. The research uncovered the tobacco industry’s ongoing opposition to health care reform, dating back to a major campaign waged against President Bill Clinton’s proposed 75 cent cigarette tax to help finance it. “Tea party symbolism is nothing new for cigarette companies and their allies, which for many years have been cynically using a hallowed symbol of American freedom in order to advance their own interests,” said co-author Rachel Grana, PhD, a CTCRE fellow. Source: University of California San Francisco Center for Tobacco Control Research and Education, February 8, 2013 – a live presentation about the paper will be viewable free at the website of UCSF’s annual Its About a Billion Lives symposium, to be held today starting 8:30 a.m. Pacific Time at UCSF. “longstanding ties” People have TIES to virtually EVERYTHING in today’s society or haven’t you noticed? You could probably prove a “tie” between Kevin Bacon and the church of satan. Doesn’t mean he knows or approves of it. This article is as full of dung as the luddite author. So, is it “Fake News” or is that it the ties just don’t matter?